Kaytlyn is using Smore newsletters to spread the word online. Pages 37 and 38 in the book about North American Owls By: Helen Roney Sattler, describes how DDT has been banned in the United States. 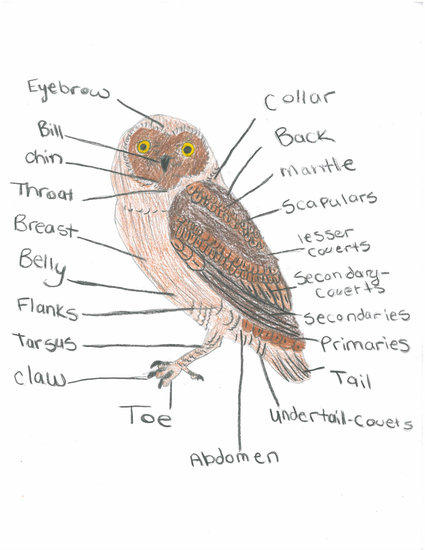 It also tells about what owls eat, and how some programs are helping them. DDT has been banned in the Unites States, because DDT makes bird eggs weak that before they hatch they brake. DDT unfortunately still remains in the soil and is still a threat even-though its not in use. Owls like to eat many things. They like to eat large insects like centipedes, and spiders. If given a chance owls will try to eat rodents, and they keep the rodent population down and keep grain-growing regions under control. People have put in a lot of effort in helping owls, because owls, used to not be welcomed on farmland. But now farmers allow them to come, live, and go as they please. Teenagers are helping owls because they are building nesting houses for owls instead of owls living in church steeples. Thats what pages 37 an 38 in the book about North American Owls, By:Helen Roney Sattler describes. Pages 35 and 36 in a book titled Book Of North American Owls, by Helen Roney Sattler, describes the future of owls. The future for them is very unpredictable, our country could've made owls become extinct if we didn't help them by banning certain chemicals in farming, such as a chemical used to kill bugs, similar to a powerful insecticide called D.D.T. Because of the D.D.T. 's effects, it was useful to farmers, for their crops, But it was NOT helpful to owls, not at all. Most owls who eat the insecticide-or more specifically, eat the mice who died of eating the insecticide, died because of food poisoning. It also made an owl's eggs so thin, they break in the nest because they are too fragile. 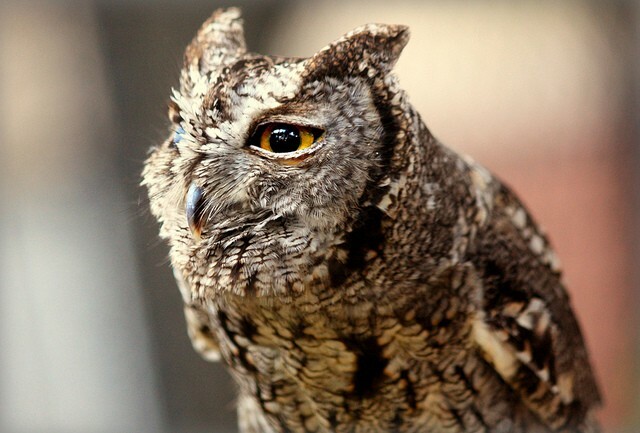 Another problem the owls faced was that most owls actually died from being shot by farmers, because at the time, farmers thought that owls made things worse for their crops, and they thought they were pests in most farms. Therefore, there was a new law that if you shot an owl, you would have to pay a heavy fine, and a penalty. Thanks to the support, owls are living today, but we can't be sure they will be safe from harm for now. They hunt at dusk and through the night. They hunt by watching from a perch and then making short flights out to take prey from foliage or from the ground. They may fly back and forth or hover among vegetation to take insects. Their Diet includes mostly large insects.They eat many caterpillars, beetles, moths, crickets, katydids, and other insects. They also sometimes eat small rodents. The females usually lay 3 eggs, sometimes 4. Their Incubation is mostly by female, incubation period not well known. Both parents bring food for their young. . They are small grayish owls with golden eyes, a greenish-yellow beak, and small ear tufts. The males have whisker-like feathers which cannot be detected in fields. Females are similar to males. 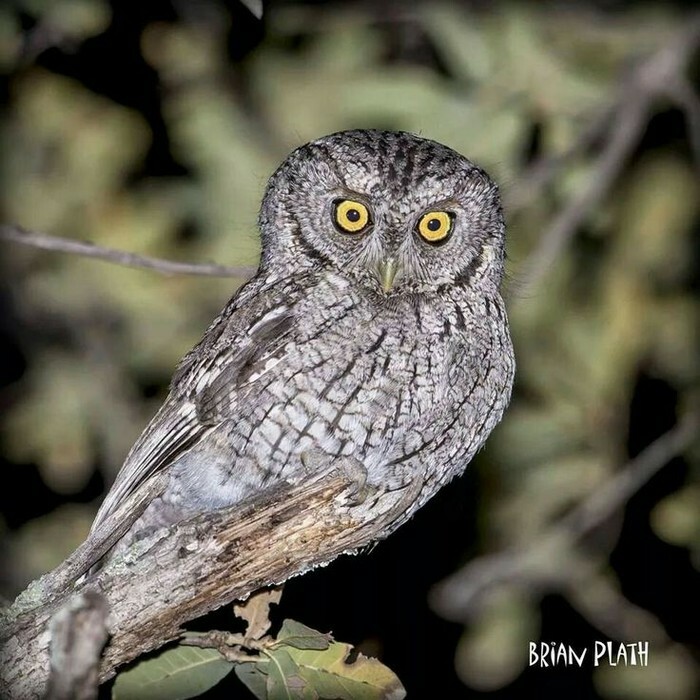 The young are grey or grayish-brown with faint crossbars on head and body. They also have inconspicuous ear tufts. 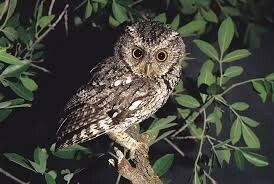 Size: The males are 16-20cm tall, they weigh 85g, and their wingspan is 40-50cm long. 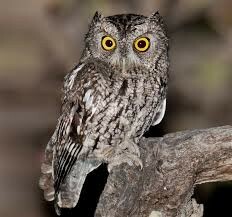 The females are 16-20cm tall, they weigh 94g (bigger than the males), and their wingspan is 40-50cm long. Range/Habitat: The range is southern new Mexico, and Arizona. Their habitat is in dense deciduous and mixed forests at high elevations. Voice: Their voice is often described as sounding like Morse code. The males voice sounds like a series of about 8 evenly spaced “ook” notes the last dropping in pitch. These noises are followed by 2 short notes, and 2-5 longer notes. The females voice is higher pitched. The females are often in duets with males. Nesting: Their nesting sites are mostly in Flicker holes, high (5.5-7m) in deciduous (oak, walnut, juniper, sycamore) trees. The female lays about 3-4 eggs, and the incubation time is unknown. Hunting habitats: They are nocturnal. They hunt from a tree perch. They sometimes flutter in tree tops catching flying insects. Crossbars: A horizontal bar, line, or stripe. DDT: A white, crystalline, water-insoluble solid, usually derived from chloral. Deciduous: A shedding in the leaves annually, as certain trees and shrubs. Dense: Having the component parts closely compacted together; crowded or compact. Detected: To discover or catch (a person) in the performance of some act. 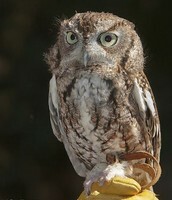 Ear Tufts: A tuft of long feathers above the eyes of some owls. Elevation: The height to which something is elevated or to which it rises. Faint: Lacking brightness, vividness, clearness, loudness, strength. Flutter: To wave, flap, or toss about. Foliage: The leaves of a plant, collectively. Habitat: The natural environment of an organism. Hover: To hang fluttering or suspended in the air. Inconspicuous: Not conspicuous, noticeable, or prominent. Incubate: To sit upon (eggs) for the purpose of hatching. Morse code: Two systems of clicks and pauses, short and long sounds, or flashes of light. Perch: A pole or rod, usually horizontal, serving as a roost for birds. Vegetation: All the plants or plant life of a place, taken as a whole. Wingspan: The distance between the wing.